We are now in the 29th week of pregnancy and things are still going smoothly. I realise looking at various pregnancy related message boards, that so far (Finds wood to touch), we have been very lucky with how well the pregnancy has gone. The only thing of note that Christine has suffered with is a few sleepless nights, a raging appetite (She blames the baby) and the latest pleasure that pregnancy has brought, is the need to purchase breast pads….nice! For the past 3 weeks, even though the Mrs feels like she is constantly growing we have remained roughly the size of an eggplant/Aubergine. Well we have finally graduated! Our little bundle of veg/fruit is now the size of a squash! *Baby’s energy is surging, thanks to white fat depositing beneath his skin. 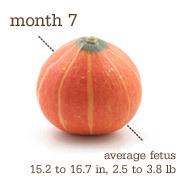 And since he’s growing so fast (weight will triple by birth), things are getting kind of cramped in the womb. What all this means?…more kicks and jabs to the ribs. Pregnancy is now becoming like a very long game of patience. It was fun and games at the beginning when the excitement first kicked in, but now we just want our baby to get here and I just know these 11 weeks are going to feel a lot longer. Still it seems so strange that in 11 weeks, I could be a dad and instead of sitting her e checking twitter and facebook, I will be changing nappies and filling bottles. *Information and image courtesy of The Bump.com. Lol shes done well not to need breastpads before now! With J i started using them at 17 weeks and this one was about 21 weeks! Did you get this reply?